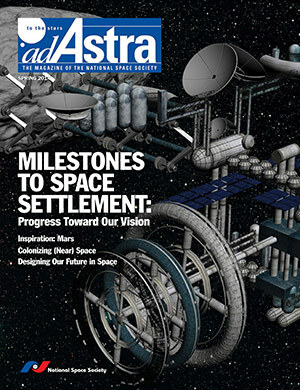 Cover image: Grand Prize Winner of the 2013 NSS Roadmap to Space Settlement International Student Art Contest: “Asteroid Mining Module” by Aleksandra Voinea, 11th Grade, Bucharest, Romania, illustrating Roadmap Milestone 18. By Luisa Fernanda Zambrano-Marin, et.al. Reviewed by Dale L. Skran, Jr.